ST. JOHN'S, N.L. 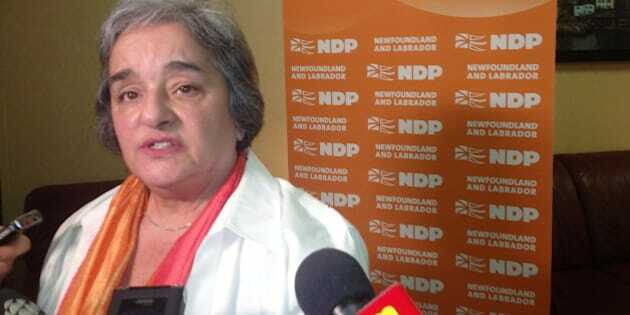 - Newfoundland and Labrador NDP Leader Lorraine Michael announced Tuesday she is stepping down as leader, saying she believes her leadership may be standing in the way of rebuilding the third-place party. Michael told a news conference in St. John's, N.L., that it's clear from their losses in four byelections that the poor public perception of the NDP has taken precedence over the party's message. "The story in the public eye continues to be not what we stand for, but how far we've fallen and whether we're relevant," said Michael, her voice breaking at times. In the fall of 2013, a messy leadership spat saw two of the party's five members quit and cross the floor to the Opposition Liberals, decimating party support and raising questions of competence. In response to criticisms of Michael's leadership style and ability to recruit new candidates, the party held a leadership convention last May. Michael was reaffirmed as leader with 75 per cent of the vote. She said she will not resign her seat in Signal Hill-Quidi Vidi, which she has represented for more than eight years. Michael, 71, became the party leader in May 2006 and was elected to the legislature in a November 2006 byelection. She is a former Roman Catholic nun and social activist. She was the only New Democrat in a Tory-dominated legislature after the 2007 election until the party made gains with five seats in the 2011 vote.